Check out all the best of the week in Issue 118 of the Tech Smart Boss Newsletter. We’ve talked about Feedier a few times on our podcast and YouTube channel, but this week wanted to give them the nod as Cool Tech of the Week. Feedier makes it easy to collect valuable feedback from your leads, customers, and anyone else that you need to collect feedback from. Their speciality is to do surveys with gamification features to encourage users to continue taking your survey. One way they do this is by allowing you to offer rewards and engagements based on their feedback (such as encouraging them to submit a review on Facebook or Google if they rated you well). Plus you can share the feedback via email, as a website widget, embedded on a page, a share link, and many other ways. 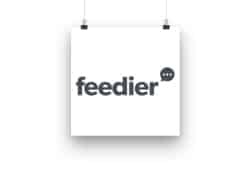 If you’re not doing feedback surveys, I would encourage you to listen to Episode 88 of the podcast to get started and while you’re at it, check out this week’s Cool Tech, Feedier.